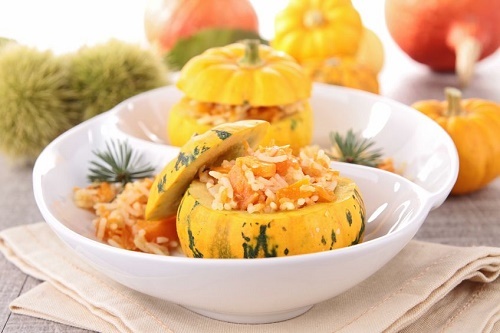 Place a sunburst squash in a pot with 3 inches of boiling water and cook for 10 minutes. Sauté onion and garlic in olive oil. Add in long grain brown rice and cook over dry heat for a few minutes. Add water and cook. Hollow out the zucchini and fill it with the stuffing. Top with Parmesan cheese and bake for 20 minutes.